When in doubt, visit your local bike shop for assistance! The portion of the frame that houses the bottom bracket is called the "shell". On steel and aluminum frames, the bottom bracket shell should be faced and chased before installing the bottom bracket. During the manufacturing process, heat at the bottom bracket shell often causes distortion of the metal, which can hinder installation and performance of the bottom bracket. Facing is the process of using specialized machining tools to ensure that the faces of the shell are concentric, parallel, and free of any paint or imperfections. Chasing entails using special taps to ensure that the threads of the shell are in good condition and free of corrosion or debris. Facing and Chasing tools are very expensive, and require considerable experience to use properly. If a shop is doing your build, they will have the tools and will face/chase as needed. If you're building your bicycle at home, you can have a local bike shop performing the necessary frame prep. If your frame is carbon fiber or if it uses one of the Press Fit bottom bracket standards like PF30, facing and chasing is not necessary. There are two common threaded bottom bracket standards: English and Italian. The country of origin does not determine the standard. There are many Italian-made frames that utilize an English bottom bracket, and many non-Italian frames that use the Italian standard. The diameter of the bottom bracket and the threading direction differs between the two standards. If you ae unsure what bottom bracket standard your frame uses, take your frame to a local bike shop for inspection. 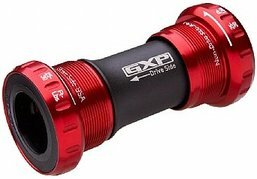 English (BSA) - The most common threaded bottom bracket type. Drive side cup - Left-hand thread (lefty tighty). Non-drive cup - Right-hand thread (righty tighty). Tighten cups to manufacturer's suggested torque setting. Italian - Slightly larger in diameter than English bottom brackets; both sides have right-hand threading. Drive side cup - Right-hand thread (righty tighty). Non-drive Cup - Left-hand thread (righty tighty). Press fit systems are currently revolutionizing bottom bracket designs, just like integrated headsets revolutionized that part of the bike. For more information on the various new bottom bracket standards, read our article here. BB30 is the most common press fit bearing system; BB86/90/92 are also utilized by various brands. Fit bearing - Insert bearing in bottom bracket, not all the way. Apply Loctite - To bottom bracket if bearing easily fits all the way. Press bearings - Using headset/bearing press. Install crank - Per manufacturers instructions. Insert sleeve in bottom bracket - In these systems the frame manufacturer provides the sleeve. It should be a very snug fit. For any additional guidance regarding bottom bracket compatibility or installation, contact us at 1-800-682-0570 or [email protected].